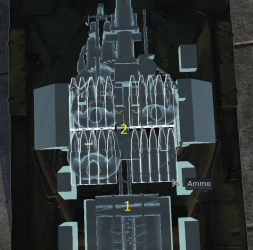 Ammo racks of the T-34-100. The T-34-100 retains the mobility and agility of the T-34-85 and combines it with a gun comparable to that of the German KwK 43 8.8 cm gun mounted on tanks like the Tiger II and Ferdinand. The T-34-100 Has very poor armour, it is unlikely to protect the crew from artillery fire, let alone other tanks. 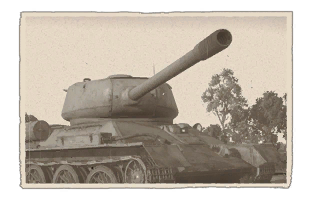 The 100mm gun is very effective even at great distance and it is strongly advised to use this tank's powerful gun and good agility as an advantage. The T-34-100 should be played with a very similar strategy to the PT-76B, using speed, agility, and firepower to 'shoot and scoot' or flank the enemy early in the game. Tank cannot compete with other 6.7 tanks very well due to thin armour. Issued in large numbers in 1940, the T-34 became largely known as one of the best medium tanks of World War II. At its introduction, there was nothing comparable in any other army in the World, the Germans were still with their Panzer IIIs and Panzer IVs while the Americans had access to their inter-war period M2 medium tank and M3 Stuart light tanks. The T-34 featured a frontal armour plate of 45 mm thick, but sloped at 60 degrees to create a 90 mm effective armour, a lot more than its contemporaries. The addition of a 76.2 mm gun also gave the T-34 a much better firepower advantage than other tanks as well. Its superiority in armour, mobility, and firepower caught the Germans by surprise when Operation Barbarossa was launched, and they found that many of their anti-tank weapons available were unable to destroy the T-34. However, poor unit coordination and crew training with the T-34 gave them little opportunities to be used in the most efficient way possible against the Germans. By 1943, however, with the T-34 shock over in Germany, they had been developing better anti-tank weapons to fight back the T-34 such as the high-velocity Pak 40 anti-tank gun. They also upgraded their current tank arsenal with better guns, such as giving the Panzer IV a 7.5 cm KwK 40 cannon that could penetrate the T-34. Not only that, the introduction of heavier, more armoured tanks such as the Panthers and Tigers with much better guns could not only take out the T-34 at long ranges, but are also immune to the 76.2 mm gun from anywhere except in really close ranges or onto the sides. This lack in firepower the T-34 experienced made the Soviet High Command advocate for a upgrade in the T-34, and after adapting an aircraft gun and a turret from a cancelled project, it was called the T-34-85, which had a 85 mm gun. The upgraded gun gave the T-34 a much needed boost in firepower that it lacked in the later part of World War II, and this model became the standard T-34 until the end of the war. In 1944, it was widely believed that the T-34-85 was still inferior to German tanks such as the Panther and attempts were made to up-gun the tank. First was the attempt by Factory No.192 to mount a higher powered 85 mm gun (dubbed the ZiS-85-BM) onto the T-34 in September 1944, but this proved a failure in trials. The second was in October 1944 where Factory "Bolshevik" develop another high-powered 85 mm gun called V-5 and V-9K, but this also proved a failure when it is unable to keep with the 88 mm gun on the Tiger II. These development then proceeded more ambitiously to a bigger gun. It was decided that the gun would be a 100 mm caliber and the task for this adaption fell to Plant No. 9 and No. 183 in July 1944. But findings say that the turret ring on the T-34-85 was not enough to mount the 100 mm cannon, and attempting to enlarge the turret ring for the IS-2 turret to 1,800 mm was impossible. It fell to A. Savinov from Factory No.92 to adapt the 100 mm gun onto the T-34-85's turret, but trials found that this improvisation was not successful due to the excessive weight of the gun. The design bureaus continued their research, now working alongside the development of the T-44 tank. A solution was to create a somewhat "hybrid" of a vehicle between the T-34 and the T-44, which resulted in a larger turret ring of 1,700 mm and other changes to the T-34 suspension to make it more durable. The turret could hold the 100 mm cannon and all the modifications made the vehicle weigh about 33 tons. This vehicle was designated the T-34-100. Trials with this gun in early 1945 using both the 100 mm ZiS-100 and the D-10T (from the SU-100) showed that the vehicle was relatively successful, even if accuracy was not the best and that the gun put a strain onto the suspensions when fired. However, the Red Army like this vehicle and pushed for further development to eliminate most of the flaws the tank is associated with. In the end of 1944, a newer 100 mm gun called the LB-1 was developed that had less recoil than the ZiS-100 and was proposed to be mounted onto the T-34 as well to eliminate the flaws the gun is doing onto the tank. But the gun was very long, extending 3 meters farther than the tank dimension itself. 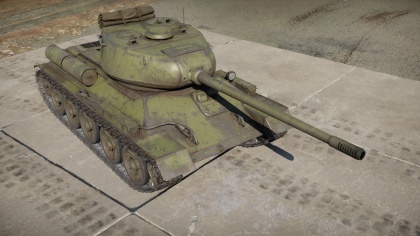 The T-34-100 mounting the LB-1 was tested in April 1945, firing tests and driving tests were conducted and it was found that the 100 mm LB-1 was much more accurate than its predecessors and did not affect the tank suspension as much. With a practical rate of fire of 5 rounds a minute, the firing rate for the caliber was a lot higher and gave the tank a much better firepower advantage when used. However, as successful the trials were, the T-34-100 never entered full production as World War II was coming to an end, with the Red Army already encircling Berlin as these tests were made. Plus, the development of newer tanks such as the T-44 would give the Red Army a new platform of upgrade flexibility, rather than continuing to use a pre-war design made in 1940. The 100 mm will live on in the T-54, a tank derived from the T-44 tank, and it would become the most numerous tank design in the world. This page was last edited on 14 March 2019, at 21:48.